A pulutan and ulam in one! Staying home on a Friday night doesn’t have to be boring. Whether you’re alone, with your girlfriend, or your barkada, the last workday of the week should definitely be celebrated. So go download that playlist, bring out those board games, or ready your stack of movies. Oh, don’t forget to grab those ice-cold bottles of beer, as well. Cheers to one hell of a night! But you know what’s missing? A damn good pulutan. Yes, yes, we know you don’t have the confidence to whip up delicious dishes yet. But hey, it’s not too late to try, here's #FHMFoodFriday to save your otherwise blah night. #FHMFoodFriday teaches you breezy, bro-approved recipes you can cook in less than a minute. 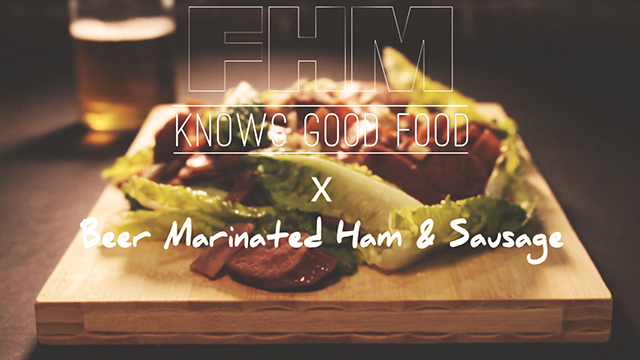 For the first video of the series, we present: Beer-Marinated Ham & Sausage. The ingredients? Ham, sausage, oil, salt, pepper, onions, garlic, lettuce, and BEER!